I have read that the winters in Alaska have 19 hours of dark. I will use dates for example. So does it lets say October 1st there is 19 hours of dark every day until lets say June 1st? Or October 1st 12 hours of dark. The next day has 13 hours of dark next day 14 hours and so on. Then it tapers down getting closer to spring. So there is really only 19 hours of dark for 1 month? Right now I would say I have 13 hours of darkness. I am about halfway between Anch, and Fairbanks. Lose 4-5 minutes a day until mid December when we have the 19 hours of dark. Then we start gaining again until mid March where it is 12 hours of light and 12 hours of dark. Continue to gain light until the first of June then we have 5 weeks of 24 hours of light. Originally Posted by Craig G.
It's not that absolute. Alaska is a big diverse state covering a lot of latitude. What holds true for Barrow doesn't hold true for Ketchikan. 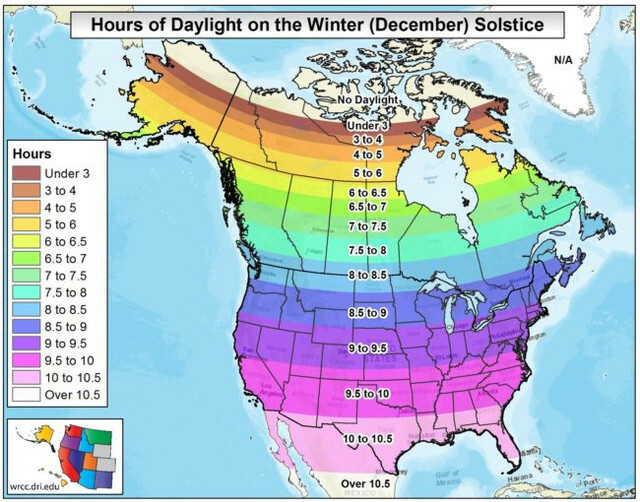 The amount of daylight isn't static over the winter either, any more than it is in Seattle or NY. Just as in points south, there's a gradual decrease in daylight during the fall, the shortest days tend to happen after Thanksgiving. By Christmas the day length starts increasing again. By June the days are quite long again. You can easily look up the average day lengths by month for various locations....it's not a mystery. I have read that the winters in Alaska have 19 hours of dark.. The extreme north has 24 hours of dark! As others have said, it depends on latitude, and the loss of light is more gradual than you've speculated. The farther north, the more dramatic the daylight loss, or gain, is from day to day. I would say that for the band of populated latitude running from Juneau to Anchorage, it seems like about 18 hours of dark is more like it. Where in Alaska? Above the Arctic Circle, on December 21st, it's dark 24 hours a day. Then the sun starts to rise for a few minutes each day and increases until June 21st when it's light 24 hours a day. The "light" during Dec-Jan isn't very bright, either, as the Sun just pops up a little on the southern horizon and then dips back down. It never gets up high enough to do any warming. Of course it's awesome in the summer when it sits just below the horizon from 11pm to 3pm and it's still light enough to be doing stuff outside. Polar nights and white nights.